Unless you’re an enthusiast or currently living in Sochi (that’s in Russia, by the way), there’s a good chance you aren't aware that the Winter Olympics are almost upon us. Yes, it’s time for all your favourite winter sports to hit the screens again; sports such as skiing, skiing off a cliff, bob-sledding and... that one with the stones. It’s probably safe to say that the Winter Olympics are the lesser of the two global sports celebrations; yet undeterred by an indifference to the four yearly snow-fest, Mario and Sonic are back to renew their new found sporting rivalry in the creatively titled, Mario and Sonic at the Sochi 2014 Olympic Winter Games. Fresh from a rather lacklustre visit to London, Mario and Sonic 2014 marks the series’ début on Wii U, with the potential to invigorate an increasingly stale franchise with new ideas. But what could have been a reinvention ultimately becomes a handful of underused new ideas mixed in with largely the same game that was released in 2010, leaving it feeling like a job half done. But let’s start with the setup, because like any good Olympic athlete, you’ll need the correct tools for the job. For the single player, there’s a mandatory requirement of the GamePad (no off-TV play here) and a Wii Remote Plus (plus optional Nunchuck), while further players will also need a MotionPlus enabled Wii Remote. So far, so good, but it’s the seemingly random implementation of these controls that will soon begin to annoy. 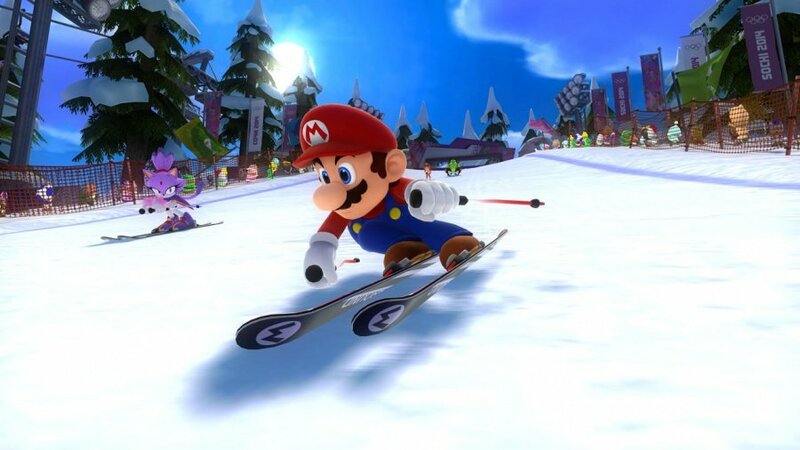 Take, for instance, Skiing, which is controlled using the Wii Remote, with motions resulting in on-screen actions. However, the almost identical snowboard event uses the GamePad as its controller, with the same motions to move your character. This seemingly random usage of the GamePad is particularly jarring when playing alone, resulting in random switches between GamePad and Wii Remote control, leaving you unsure of what you will be using next. And it’s a shame it doesn’t just use the GamePad as a secondary screen, as when it does, the results are pleasing. Straight from the main menu, the GamePad is used as a new Mario and Sonic TV hub, which offers high scores, online leaderboards and friend rankings in the palm of your hand. For events not using the GamePad, this TV idea is pushed further, with Toad and Omochao (and a couple of Mario Penguins) presenting live event coverage from a TV studio. It’s a charming use of the second screen, but it being on the GamePad introduces a big problem – visibility. Throughout the event, the studio panel will commentate on the proceedings, with comments displayed on the GamePad only. The problem is immediately obvious – if you’re alone you’ll be watching the TV, and if you’re with friends no-one will be paying attention. The fact that the studio guests idea also takes advantage of player tips from Miiverse makes the lack of visibility of this clever feature all the more disappointing. The big question this will leave you with is why — in a game that often feels so dry and humourless — is this charming presentation method not used throughout? The Miiverse functionality is something that should be commended though, and it ties in, again, with the TV aspect of the game. After setting a high score, you’ll be interviewed by Omochao, who asks you for tips for other competitors; these tips will ultimately be fed into other player’s TV feeds. You’re also given an opportunity to use the Wii U camera to take a photo of your victorious self, which will be shared with your friends next time they load the TV hub. But that isn’t to say the presentation of Mario and Sonic 2014 is bad, far from it. Taking a less is more approach, the menus are slick and easy to navigate, with options easy to find and access. The audio work is also brilliant, with remixes of various Mario and Sonic tunes making up the most pleasing of the game’s selection. However, with inside events the audio work leaves something to be desired, with the crowd noises in the Ice Hockey arena likely to make dogs start barking, and the same audio cues being recycled from past games. And that feeling of wishing there was something a bit more is what pervades the whole of Mario and Sonic 2014, with the events themselves proving to be overly simple or just plain boring. But perhaps that’s more indicative of being handcuffed by the Winter Olympic events themselves, as unlike the summer games, winter events largely consist of putting on skis and going down a slope. Events such as Skiing, Ice Skating, Snowboarding and Bobsleigh all make their expected returns from the last game, and control almost exactly the same as their 2010 equivalents, albeit with more finesse afforded by increasingly accurate motion detection, a welcome addition particularly in the figure skating events. The bobsleigh event does make some effort to make use of the GamePad by giving player one a first-person view of the track, and akin to Nintendo Land, uses the camera to show their intense concentration to the rest of the team on the main screen. Likewise, the Biathlon event uses the GamePad as the rifle for the first player on the shooting range – an obvious advantage when you consider the small amount of space on the TV. And it’s in events like these where being on Wii U makes sense, with the GamePad adding to the experience. It’s a shame then, that the vast majority of the events opt to ignore it, and events such as Ice Hockey shoehorn in ‘draw on the screen to shoot’ style gimmicks — although it should be noted that Ice Hockey does scratch that Mario Strikers itch nicely. 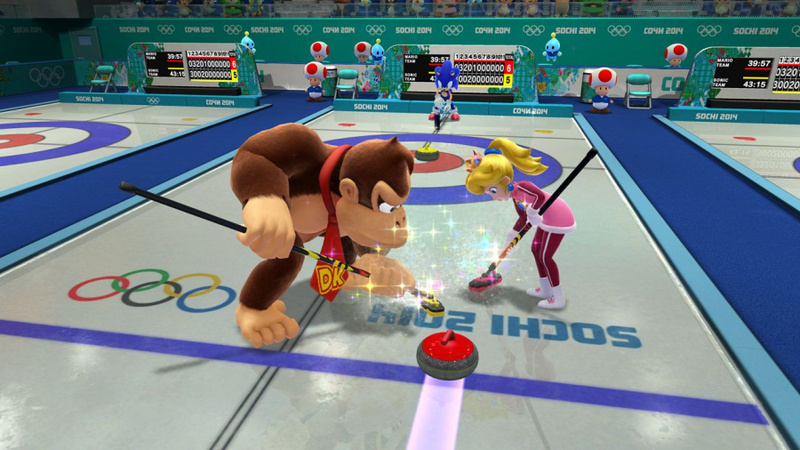 Other events, such as Curling, feel incredibly out of place among the rapid and simplistic events that surround it, with the game insisting on using the GamePad to map out strategies before brushing the stone to the target, when really all you want to do is hurl stones down an icy track. If these events sound overly familiar to you, then you’re right. Aside from cosmetic changes, the Olympic events are largely the same as the 2010 game, with all the faults and tedium that existed in them four years ago. Simply put, sliding down snowy mountains isn’t that much fun. But move away from the Olympic license, and things become much more interesting. Spread across eight disciplines, the Dream Events let the creativity flow, and take the existing dull sports and add the Mario and Sonic licenses to them. From racing around Sonic Adventure’s Speed Highway in a bobsleigh to snowboarding around Mushroom Bridge, the Dream Events are where the game stops taking itself so seriously and gives players a blast of nostalgia while you compete. 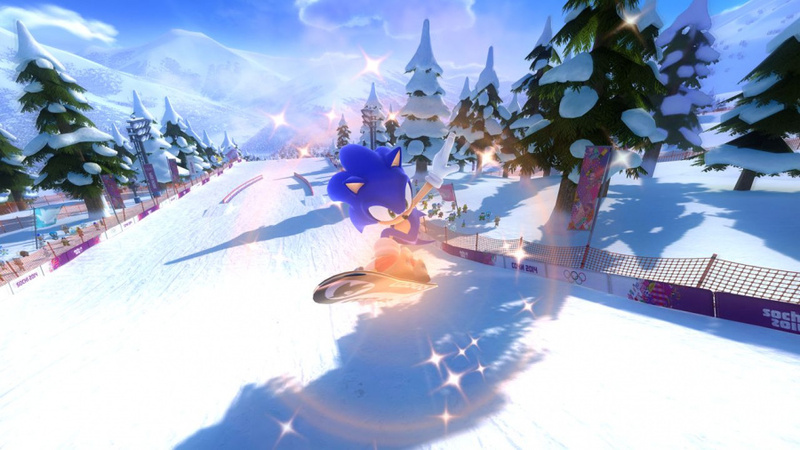 Winter Sports Champion Race is particularly clever, putting you in a race using various modes of winter transport, while the Snowball Scrimmage event is the closest you’ll ever get to a Mario and Sonic shooter. While you can play any of the events individually, Mario and Sonic 2014 sees the welcome return of the Medley modes, allowing you to play events in succession with friends. There’s also the single player “Legends Showdown” to tackle, a rapid-fire visit to all the events, including boss battles against the likes of King Boo and, for some reason, Jet the Hawk. The game also makes an attempt to claim space at parties with the “Action and Answer Tour”, a mode that can only be described as painfully dull. Ditching the enjoyable London Party mode from 2012, this new party mode puts you in a game show hosted by a surprisingly unfunny Cubot and Orbot, who spend more time talking than you do playing events. Once you eventually make it to an event, they are incredibly simplistic, and often task you with simply answering a question – Ice Hockey, for example, is a five second event where you put the puck in the correct answer net. It’s an ill-thought out mode, and one that is unlikely to win many people over this Christmas. Mario and Sonic 2014 also marks the series’ online debut, but with only four events on offer it’s a surprisingly limited début. While it’s understandable that Curling would make for a boring online sport, it makes no sense to not include ice hockey or even high score events such as ski jumping, and with a limited selection this is ultimately an underwhelming inclusion. The move to Wii U has however yielded a big graphical improvement, and the character models in particular look better than ever (although there are no newcomers to the roster, sorry Espio fans). The Sochi Olympic Park has (presumably) been faithfully recreated, but the biggest draw will be Mario and Sonic locales in HD for the first time – Isle Delfino in particular looks glorious in HD, and is also curiously the perfect fit for a game of ice hockey. Mario and Sonic 2014 feels like a minor progression, and not the huge leap you might be expecting. Taking a lot of its cues from the 2010 game, and ignoring the rapid-fire party experience of 2012, this latest edition hits some of the right buttons, but they’re the same unremarkable buttons that were hit four years ago. The inclusion of online is certainly welcome, but too limited, while the inventive TV idea used on the GamePad is never taken far enough. But that said, with a group of friends, there’s still a lot of fun to be had here; it’s just hard to shake that feeling that you’ve done it all before. Great...I guess that kinda dulls my excitement for this. ALL THE MORE EXITED FOR SUPER MARIO 3D WORLD!!! Hmm. This is just high enough of a review score to warrant me picking it up this holiday. I loved the trailers. Looks like I'd have a lot of fun with my fiance playing this. "While it’s understandable that Curling would make for a boring online sport." Curling a boring sport?!? I don't understand you guys anymore. After enjoying the london and winter olympics, I might get some enjoyment outta this one despite the score. I liked London and winter, so I'll hopefully like this too, especially since it has 3D LAND!!!! I love the Winter Olympics! Even if we (the UK) aren't very successful (one medal in each of the last two olympics). My favorite event would be curling. We are actually OK at that...thanks to the Scottish. Anyway, I'm not interested in this game, unless Nintendo decides to release the blue Wii remote bundle in the UK. Seriously though, SEGA, can you give it a break for Rio? The idea is getting stale now. Gaz, I get the feeling that your disinterest in skiing, hockey, etc affected your enjoyment of the game. Completely understandable, but I do wonder if your score reflects that. For argument's sake, let's assume we have identical taste in gameplay. As someone who does enjoy the Winter Games and didn't play the last one, do you think that my experience with this game would be more positive than yours? "a rather lacklustre visit to London"
I strongly disagree. London 2012 was the best, and the most fun in the series. Well at least it comes with a blue wiimote! @Gerbwmu What of the PS Vita? I feel the Winter Olympics almost even with Summer, but I'm in Murica, so I dunno if that matters. I was sooooo looking forward to this, was hoping for it to be super good. Are u sure u might not like it more on a day u feel a lil less cranky? @CaviarMeths I actually enjoy watching the Winter Olympics more than the Summer Olympics, but skiing down a slope or sitting in a bobsled on a track does not make for fun gameplay. And the Ice Hockey is fun enough, just not as fun as it could be. Is the game 1080p or 720p? I actually made a rant on how this game would be a rehash, and I was right. Whaddaya know? Never played a Mario & Sonic game. And I still intend to get this and enjoy it. @mariobro4 Curling is basically Extreme Frozen-Water Floor Sweeping, which many people do not find to be as engaging as basket-weaving. @GazPlant Thanks, I might consider getting this for the local multiplayer then. I've got a big family and this would be right up their alley, I think. Meh, can't say i really expected much from this game. @CaviarMeths Your first comment is almost exactly what I was thinking. Gaz seems generally disinterested in this whole game BEFORE he even played it. I've always thought Olympic games were boring so I've never played one, but I only want this for the Dream events. (BTW Gaz, Strikers is soccer, not ice hockey, that was in Mario Sports Mix which my kids love.) My oldest son - reading over my shoulder as always) still thinks this will be a good game for us as we haven't played any earlier games in the series. Seemed like an honest review, from somebody who honestly doesn't like these types of games. "there’s a good chance you aren't aware that the Winter Olympics are almost upon us." Anybody who lives in the US and watches anything on channel 4 knows the olympics are coming. As do gay rights advocates, Soochi is practically a rallying cry. Hardly anybody may know about this game, but thanks to NL for reviewing it, I was worried it had been forgotten. 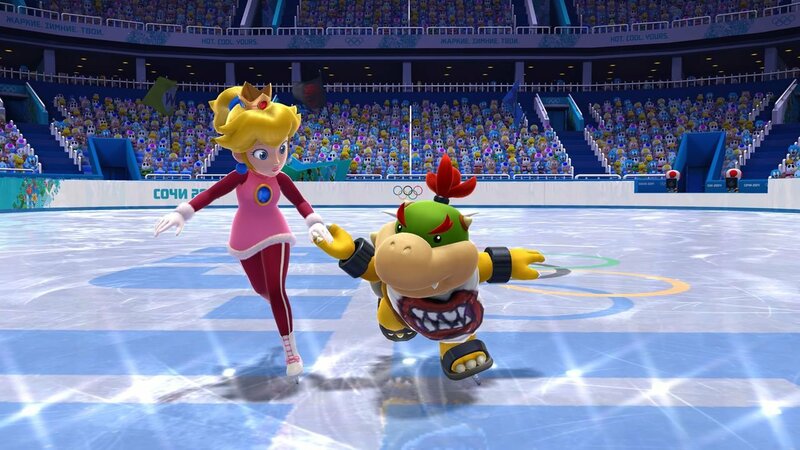 Wouldn't Birdo be banned from Sochi? Sega's not doing so well when it comes to developing Wii U games. How about giving us Phantasy Star instead of more Sonic games, Sonic Team? Tried the first summer and winter games, neither were great, they seem like HUGE misses on controls, with obtuse mixed with poorly implemented motion controls. Downhill skiing should be hard to get wrong, bit the last winter games made it unenjoyable. Summer games track and field events should work naturally w/motion controls, bit instead you are always wondering what to do (and waiting through menus and introductions that take longer than the events -that's OK for TV, terrible for a game). I skipped London, and had honestly given up on this before trying it b/c of playing the first Summer and Winter games. Though a good game designer could make a great game out of this I'm sure. This is a series well past its sell by date... Take it out on the pasture n put it out of its misery!! How do these Devs get continual funding when its the same average, uninspired pish they churn out time after time!! Does this not use the Wii balance board at all? That's a shame, I enjoyed the balance board use in the first M&S winter games. I didn't play it much though sadly. I'll be honest, I wasn't going to pick this game up, it looks okay though. The graphics in this game looks really good though... I usually have low expectation of Party games, including Wii Party U that gets very low score in metacritic. The London one was the closest one to being great, but it looks like they went downhill again. (lol) I'll still give a rental since I usually find some enjoyment in these games. Glad to read that the music is good again. I've been listening to the M&S London soundtrack a bit recently. I really loved SEGA's spin on some of the classic Nintendo tunes in that game. I still think it's hilarious that such a team-up...one that we dreamed for as children, is just a minigame compilation. I played every single Mario and sonic game and my favorite would be the London one, so I might get this one just for online play. Sounds like it might be worth renting first. Never played the others and my wife and I are looking for fun co-op games. I wonder if this game would score higher for people who have never played the others? Oh well, at least 3DWorld isn't far off! @fluggy Cause they sell millions of copies each time and make the company lots of money. Wii U needs games like this, whether they get good reviews or not. I would say rent this game folks, and if you like it, buy it. The writer is not a fan of the Olympics, he makes that very clear when he says most people dont know they are going to occur soon. I like the Olympics, not a rabid fan, but I know well enough they are in the even years and its time for Winter. And the fact that you dislike Curling pretty much makes your opinion on everything in the world irrelevant... just kidding... maybe. (I'd watch 3 hours of curling over 20 minutes of soccer/European Football any day of the week). Meh. I'd rather see a decently-made adventure starring Mario and Sonic, personally. I'd like to know if it has balance board support and what the 4 online events are. Does this have Adventure Tours mode? If yes then I'll get it. Adventure Tours was a lot of fun for me from the last Mario and Sonic winter games for the DS. "it’s time for all your favourite winter sports to hit the screens again; sports such as skiing, skiing off a cliff, bob-sledding and... that one with the stones." Umm, how about hockey? I know you guys are mostly British and all but come on. That aside pretty good review. Maybe the pack-in remote will get me to buy it. Probably not though. all party games are small so if you play them before your freinds get here your gonna be negitive about it so you wont play it..
"it makes no sense to not include ice hockey or even high score events such as ski jumping, and with a limited selection this is ultimately an underwhelming inclusion." So much this! Seriously bragging rights in hockey is what props the Winter Olympics in real life. It's the best event, Vancouver 2010 had surprisingly deep controls including the ability to dump and chase the puck, and would have been a purchase for me had they included it for online play. I only got to play the DS version of the first entry in the series, wanted to try a Wii version but never could. So I kind of was looking forward to this, but makes sense that I don't now, since I mostly play alone and this is a "multiplayer game". Still, looks like it could be fun even in single player, and if its coming bunddled with a Remote Plus like some people are saying, that I might give it chance. I had the first one and it was alright. This one does seem cool though. May be a good game to add to the Christmas list or get on the cheap side. Annoyingly, the Remote bundle seems to only be in the US. Very unfair. That, along with this review and the other games coming out this month (good versions of Assassins Creed IV and Batman, Lego Marvel SH, Mario) plus Wii U Party and Deus Ex HR just out makes it very unlikely I'll be buying this. More effort next time Sega. @OdnetninAges I avoided London 2012 because I was sick of hearing about the Olympics at the time but do like this type of game, would you say 2012 is much better than the rest of the series as this review has put me off this new one!?! I played the last w Olympics one on Wii and had fun but got bored quickly but I figured the events are better in the normal one. Well these kind of games sell better in the Americas... Same goes for Wii Party U, so there's no surprise they'll seemly bundle it with a Remote to attract buyers. Hopefully it'll do well, I'd like to see more from Nintendo/SEGA in the future. Well, I've never played any of the previous entries, so I'm not exactly sure what the rating would mean for me... But for the time being there are better games coming anyway and I'm not so interested in a party game. Never touched a Mario and Sonic Olympic game. Considering to get it due to the Online feature and supporting my country. The score, just makes me depressed that I might need to reconsider that thought. I knew it would get slated in the reviews. I'm keeping my pre-order anyway, as I know I'll still get enough out of it for my £30. The other Olympics titles got similar scores, and each time I found them fun and enjoyable. Games journo's are overrated! The disrespect of the sport of curling here is disgusting. I'm not a huge fan but come on. Anyone who was excited for this game. After playing Wii Fit U yesterday I'm even more bummed this doesn't have balance board support. If a $20 game can have it, and the previous game in the series that looks just llke this one has it, and Nintendo is planing on balance boards being sold w/ Wii Fit U, why not include it in this game so people have more reason to buy it? And I don't need another Wiimote, if I did I would have bought Party U by now. We're still probably going to get this, it's a long cold winter in the northeast and the kids need their exercise, but maybe I'll wait until our 31 day free trial is over. @GazPlant Are you given the option to chose a country or a region independent option (Global, Worldwide, Other, etc like Wii Sports Club does) for the online games and leaderboards, or is it locked to your NNID or real location? so... how many sports are actually in this game? I know there is 4 online sports. I was actually quite excited for this game.... this review is making me question it. Good, well reasoned review. However, it sounds like the reviewer just isn't a fan of this type of game or maybe even the original which Nintendo Life reviewed as a 9/10. If this is fundamentally quite similar to the original with on-line then I am optimistic for it to be honest. The review itself reads like a 7 looking at the scoring policy of this site as well. There IS a 3DS one coming out too by the way? Heard nothing about it other that it is in production and available for pre-order. No screenshots/trailers/gameplay - nothing. Thats about what i expect from this series, really. While i'm a huge fan of Mario, Sonic, and the Olympics, for some reason a combination of the three comes out subpar. Wow, that's.. disappointing. Still getting it though. Just because. Just maybe not at launch. I really anted this but refused to buy it because of Russia's human rights records to Protest people like green peace and gay rights and people protesting for simple things i dont want to suport russia in anyway or form. I feel so sory for the people trying to standup for thier simple rights against the backwards thinking smallminded government. Didn't play the 2010 Winter Games one so it'll be fresh for me. All of these things sound like pluses to me. Sounds like a good add for all the buy 2 get 1 free deals I'm sure are coming in a few weeks. I still think I'm getting this. I need a new Wii remote too, so that bundle is appealing to me. Very fair review from everything that I have read/seen. This series has never really appealed to be though. And besides, once Super Mario 3D World arrives I doubt that disc will be leaving my Wii U until Tropical Freeze is released. They need to make a Mario & Sonic platformer. @UnseatingKDawg Yes, I've said that before! I wish they would quit making these olympic games. Even a Sonic and Mario RPG would be more welcome. What others and I have also said, "I'm not a fan of sports-mush games (like Olympics), because they spread the gameplay into smaller pieces of fun. " SEGA has more potential than this (I think). I love seeing all the characters, but please, SEGA, work with Nintendo on better stuff. I'll prob'ly get it anyways. The Winter Olympic Games was funner than the Olympic Games (haven't played the full 2012 yet). I think they should do more dream events, add more characters (Shy Guy FTW), and not ever again have that remote switch up that you mentioned. I never thought M&S would be fun, but when I tried it, it was amazing. At least the Winter one was, so I'll definately give this a try. Out of all 3, the Wii version of London 2012 is my personal favorite in the series. It was summer (which I preferred more than Winter), it had the best and most fun Dream Events, and it had improved controls compared to the original. (The original is terrible compared to London 2012). And I very much liked the London Party mode. If there's a way for you to rent it, I recommend doing that first and seeing what you think, but it's still a very fun title. I haven't played the Sochi one yet, but it doesn't look as fun as 2012 to me. There also aren't as many Dream Events in the Sochi game as there are in London 2012, which is disappointing to say the least. @Williaint: I liked the Olympic games at first. Until the London games on 3DS - they seemed like "chunks" of events as opposed to full-fledged events. But yeah, an RPG would be awesome. They could do an action style similar to Mario & Luigi where you always have to be on your toes. And they could do their own classic moves - Mario with the Fire Flower and Tanooki Tail, and Sonic with his Spin-Dash, and even other characters - Shadow could use Chaos powers, Wario could fart on enemies to stun them - possibilities are endless. @FilmerNgameR: Absolutely! I know it's two different styles, but they could somehow put them together and pull it off, a la Sonic Generations. "there’s still a lot of fun to be had here; it’s just hard to shake that feeling that you’ve done it all before." What would its score be for me, someone who never played any of the Mario/Sonic games? @element187 My fiance games a lot, but she's mostly on the 3DS train. She plays Wii U sometimes, but not too often. Last console game she played was Bayonetta in preparation for Bayonetta 2. We really enjoy playing games like Wii Party U and Mario Party together, so I think we'll enjoy this Mario & Sonic game. It bothers me how party games get so much crap from so many gamers. If they're fun to play with friends and family, then they are good and they have value. I love games that are difficult and involved and have stories, but not every good game has to have those elements. @UnseatingKDawg Yeah and it makes more sense for Eggman and Bowser to team up to take over the world. Taking over the Olympics just makes no sense anymore. @SkywardCrowbar I never understood that mentality some gamers take towards genres they don't like. If it doesn't have blood and bullets it's not worthy.... Party games, while not my favorite genre, serve a purpose. I pick a few up because its fun with friends/family. Absolutely nothing wrong with that. 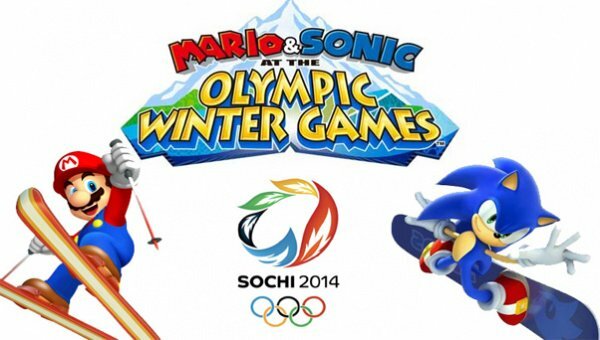 I hope we will like Mario/Sonic @ Sochi. I never played any of these titles in this series, but it looks like fun, has some online play and my wife loves figure skating. So I hope it clicks with us. This review seems to come from a point of view of "I played every game in this franchise and I'm getting bored with it"..... Well what about others who never played one? Maybe I can find a reviewer that has no experience in the series as well. I'll only pick up this game if I could get the Motion Plus controller thats bundled with it. I just play games because I want to. One of the main weaknesses of the Mario & Sonic Olympic events games is that the controls are something to get used to, but if you can make it work for you, they're good games. For me, it's also the concept of the game itself. 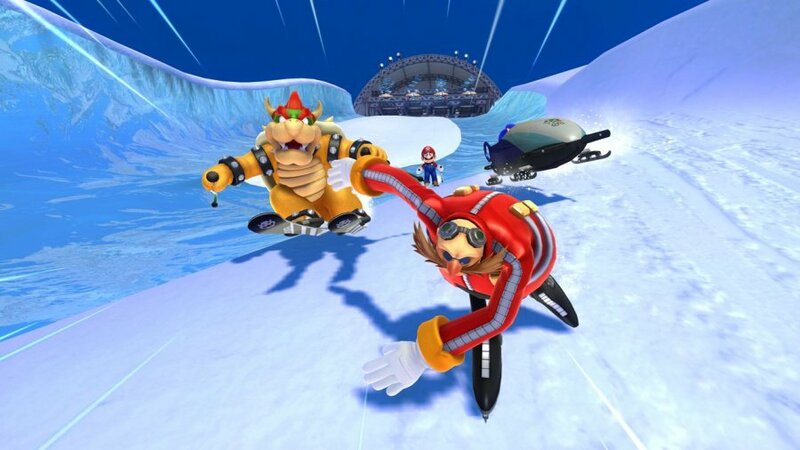 The 2010 Winter events is by far my favorite Mario & Sonic Olympic game because of the Fesitval Mode that plays just like the actual events themselves, and you can buy clothes and equipment for your Miis as well as secrets. Those modes and features weren't in the 2012 summer events (which was a serious letdown for me). The 2012 Mario & Sonic events was more or less like those Mario Party games. I'm just hoping that this upcoming Mario & Sonic Olympic events is much like in 2010 not just in controls, but game modes as well. I was really looking forward to balance board support. Hopefully the reviewer just failed to mention it, or Nintendo can release a patch to enable it. @Luna-Harmony Oh, and how is Mario & Sonic in any way related to the viewpoints of the Russian government? Who is your boycott actually hurting and sending a message to in protest? Sega or the Russian government?